Melt margarine in medium nonstick skillet over medium-high heat. Add onions and bell peppers; cook 2 to 3 minutes or until vegetables are crisp-tender, stirring occasionally. Meanwhile, in medium bowl, combine eggs, milk, salt and pepper; beat well. Pour egg mixture over vegetables in skillet. Reduce heat to medium; cook 4 to 6 minutes or until eggs are set but still moist, stirring frequently. 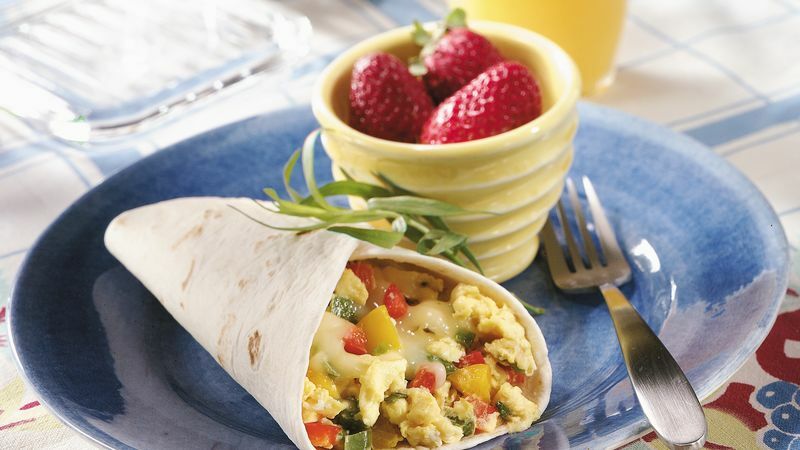 To serve, spoon egg mixture onto warm tortillas; sprinkle with cheese. Roll up. Prepare these burritos with colorful, flavored tortillas such as garden vegetable or tomato-basil. Look for them in the deli, bakery or dairy case in the grocery store. To reduce the fat in each serving of these burritos by about 8 grams and the cholesterol by about 320 grams, use refrigerated or frozen fat-free egg product. Thaw the frozen egg product before using it. For spicy burritos, season the egg mixture with 1/8 teaspoon ground red pepper (cayenne).